1. Elevators and Lobbies. 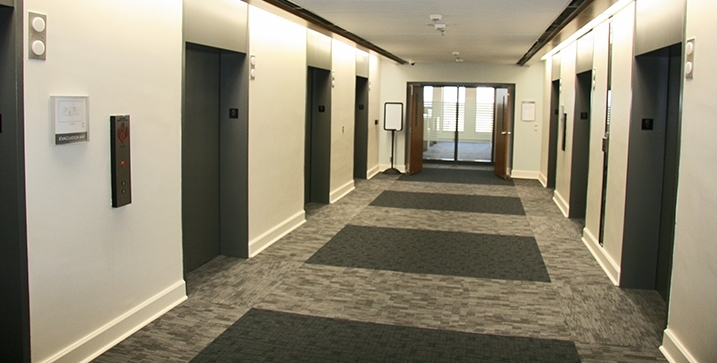 We like to recommend luxury vinyl tile (LVT) for elevators, lobbies and service corridors. LVT offers durability, many design options, and can replicate the look of natural stone and wood flooring. Wood, stone flooring all have extensive installation costs and maintenance requirements. In contrast, LVT costs significantly less to install; and comes occupancy ready with a protective wear layer that only requires mopping, sweeping or vacuuming to retain a new appearance. Depending upon the wear layer you can get up to 10 years of service before it needs to be reapplied. But the biggest advantage of all is that it’s super easy to repair. Because it’s laid in tiles, damaged pieces—if that ever happens—can be lifted and replaced easily. And don’t worry, we have plenty of low-VOC (volatile organic compounds) options. 2. Halls and Corridors. Carpeting is the best bet for halls and corridors. It’s reasonably priced, it’s easy to clean, it dampens sound considerably, and it looks luxurious. It’s not hard to keep carpeting looking great. The secret is to vacuum it lots with a serious commercial vacuum and have it professionally cleaned at least once a year depending on the foot traffic you have. (We even provide this maintenance service.) We have every kind of commercial carpeting you can think of including carpet tiles, and we have a large quick-ship inventory. When you’re putting down flooring in a multi-tenant building, you have to think long-term. Is the flooring going to last? Is it going to look good for a long time? Let us help you with your renovations. We will work with you and help you choose what works best for you based on your individual needs. We even offer painting services and moving services!